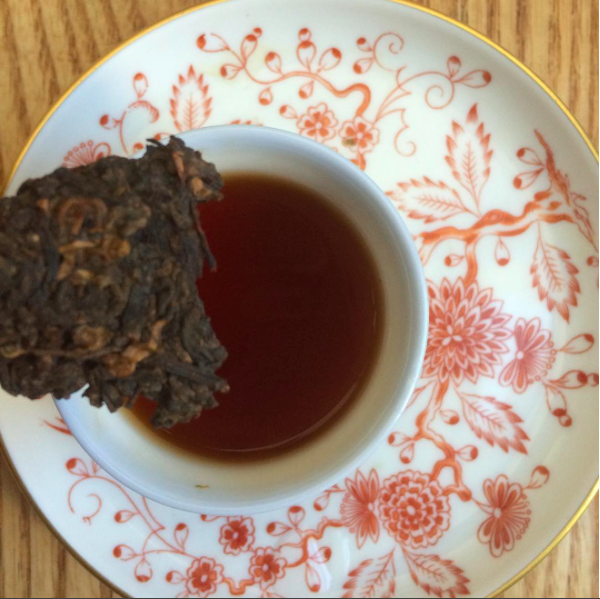 The first time I drank puerh, and I think it was a shou, was when I lived in Berkeley, California, where I purchased a small amount of the tea at a Whole Foods Market. I did not enjoy the tea then nor on any of the subsequent occasions afterward until last week when I conducted a tasting of shou with Dr. Christine TN Wong, an independent consultant and educator. The tea I steeped was a 2007 Ripe Palace Mo Hei courtesy of Teanami. For evaluation purposes I used 3 grams of tea. The leaves were infused in 212F water for 3 minutes then 3.5 minutes. The dry leaf smelled fungal, musty, and sweet (dried, red fruit). The leaves were pieces from a cake, were variations on brown, and were dry and rough. The color of the first infusion was a dark red brown but as it poured looked inky. Describing the color was the simplest part of this tasting. Otherwise, the liquor was a cacophony of mouthfeel, taste, and smell. The tea tasted like eating a raw mushroom or wet cardboard or maybe like drinking mushroom juice. There was an underlying molasses sweetness as well as a dryness that I experienced in the roof and cheeks of my mouth. As the liquor cooled, it became thicker and heavier. All the flavor lingered. There wasn't a traditional smoky notes per se but I did detect a leather belt flavor (as in licking a leather belt). When pressed, I described the taste as drinking a lapsang souchong with milk. The infused tea leaves were small and inconsistently sized. The leaves were all a dark red brown color after steeping and smelled deep, rich, and of mushrooms in a paper bag. The liquor from the second infusion had the color of a zinfandel. The tea smelled again like mushrooms in a paper bag with a light sweet smell off the steam. The taste was fungal, funky, and of forest soil below the top layer of decomposing leaves. The mouthfeel was heavier than the first infusion but not dramatically so, and the flavors lingered here too. The infused leaves were lighter in color than after the first infusion but still had "legs", staining the gaiwan. Overall, the aromatic profile of this tea is mushrooms in a paper bag and forest soil. The liquor from the first steep was bolder than the second one. The second infusion yield an integrated, smoother and sweeter tea. I felt heady after drinking this tea. The "webbing" effect that I first felt while drinking the second infusion intensified. I don't think I could drink a long session of shou. How do you feel when you drink a ripe puerh? I know you aren't really near the San Fran area but in case you are looking for tix for the upcoming tea festival there The Sororitea Sisters are giving away a pair! http://sororiteasisters.com/2016/09/27/sf-international-tea-festival-ticket-giveaway/ we would love for you to swing by and enter or if you know of anyone else interested. Hi Jennifer, thanks for commenting. I would enter the giveaway if I lived in the Bay Area. I'll mention on Twitter.